Would the world blame Israel if Iranian nuclear talks fail? 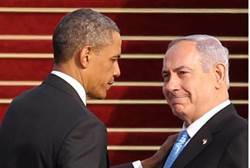 Israeli Prime Minister Benjamin Netanyahu has been pretty clear that his country is wary of the burgeoning nuclear talks between the United States and Iran, which he worries could be an Iranian ploy meant to undermine Western resolve and to buy time for uranium enrichment. The Obama administration, which takes those concerns seriously but still thinks a deal is promising enough to at least pursue, is taking pains to bring Netanyahu on board, understanding that they’ll need at least some degree of Israeli support to make the deal work. So, while Israel doesn’t quite oppose a nuclear deal outright, the country’s leadership has expressed lots of skepticism and has set its requirements for a minimally acceptable deal pretty high, which does make any deal tougher to get. Maybe that’s a bad thing for the nuclear talks — some are worried that Netanyahu would try to derail a deal not to his liking — and maybe it actually helps a bit, allowing the United States to play good cop as it mediates between Jerusalem and Tehran. The key here is perception — Israel doesn’t actually need to have scuttled a deal outright if the international conclusion is that the deal fell apart in some significant part because of Israel’s hard-line position. And the concern is not that, say, the United States will suddenly decide to break from its Israeli ally or deconstruct sanctions. That’s not going to happen because the U.S. political consensus would never allow for either. The concern is Europe. The continent has imposed severe sanctions on Iran, which are a major component of the country’s political and economic isolation as punishment for its nuclear program. But European politics are still a bit more skeptical of the effort to isolate Iran — in September, a European Union court threw out some sanctions on Iran. European politics have also been increasingly wary of supporting Israel, particularly over the country’s occupation of Palestinian territories and the repeated failures of Israeli-Palestinian peace talks. If European politicians and voters come to believe that a workable Iranian nuclear deal fell apart under Israeli pressure, rightly or wrongly, then the continent could well lose some of its taste for isolating Iran and for supporting Israel against Tehran. Long-term, that would give Iran a freer hand to take its nuclear program in whatever direction it might wish. This is why Israel’s dilemma is so complicated. If Netanyahu is absolutely sure that Tehran wants a nuclear weapon, his challenge is how to stop that from happening — including perhaps by opposing the nuclear talks he sees as enabling Iran — without drawing so much of the blame that European sanctions weaken. That’s why it’s so important for the Obama administration to convince Netanyahu that they share his skepticism: If they convince him that they will oppose any deal likely to enable Iranian enrichment, that reassures Netanyahu and makes him less likely to oppose it himself. This may help explain why the White House is going so far out of its way to work with the Israelis on negotiations. In Pollack’s telling, Israeli leaders are well aware of this, which may perhaps explain why Netanyahu has not been more strident in his criticism of the nuclear talks. It’s a reminder that these talks are high-risk as well as potentially high-reward for all involved, with Jerusalem walking its own political tightrope just as are Washington and Tehran.